On a chilly evening earlier in November, geisha Kikuno and her two apprentice maiko host an event that gives guests an opportunity to experience a dinner party with traditional female entertainers. The atmosphere at Sushi Isshin, a restaurant in Tokyo’s Yushima district, is boisterous as the guests chat among themselves or with their neighbors. The entertainers, who are visiting from Nara, invite the guests to sip on sake and enjoy a full-course sushi dinner served by second-generation owner Hirosada Okamoto. However, a hush descends on the crowd when the three hostesses begin their performance, with Kikuno dancing gracefully to the soft plucking sound of the shamisen. The guests applaud enthusiastically once the performance comes to an end, and the hostesses turn their attention to games. The games aren’t particularly difficult, but they’re often accompanied by a song and the loser is required to down a cup of sake. With Kikuno leading proceedings, the guests laugh loudly as each loser throws back their drink. It’s a scene reminiscent of a college party, albeit with wildly different participants. At the conclusion of the evening, the guests shuffle out onto the street contented. Kikuno also looks satisfied, having proven to be a charming host with a dry sense of humor. The evening is part of her Kagai Restoration Project in Ganrinin, which she launched in 2012 to revitalize geisha culture in Nara’s Ganrinin district, where she has been the only active traditional female entertainer for the past 15 years. Kikuno has been involved in geisha culture for about 30 years. She describes herself as being a bit of a tomboy with short hair at school, and she initially had little interest in becoming an entertainer. Kikuno had just completed junior high school when she was scouted to become an apprentice through her aunt, who was running a teahouse for geisha at the time. Kikuno’s training began at the age of 15, when she learned such things as how to fold and put on a kimono and how to sit with her legs folded beneath her. She was instructed to avoid spending time with her family and friends as well as shun pop music, because it would affect the way she could hear notes on a shamisen. Her days were filled with nagauta and kouta music lessons as well as classes on tea ceremony, flower arrangement, calligraphy and Japanese dance. In the evenings, she was instructed to sit in the corner of a tatami room in a kimono and watch the geisha in the teahouse entertain. She learned when to change ashtrays, pour sake and how to converse with guests. Kikuno made her debut as a maiko at the age of 18 and her life instantly became more hectic. She would put on her makeup and kimono and attend dance lessons in the morning. This was typically followed by a lunch party, after which she would go to a nagauta lesson and then attend an evening party, finding time to eat light meals in between. After 8 p.m., Kikuno would return to her teahouse and attend to guests until about midnight. Kikuno recalls being so physically exhausted that she would collapse once every six months or so after suffering from such ailments as a hernia and liver damage. She became a geisha at the age of 23. As the years passed, the other geisha in her circle retired or quit and, before she knew it, she was the sole geisha in Nara. Geisha culture dates back to the Edo Period (1603-1868). Some of the oldest and most prestigious karyūkai geisha districts in the country are Kyoto’s Gion Kobu and Kamishichiken, and Tokyo’s Asakusa, Kagurazaka and Shinbashi. Sumi Asahara, a journalist who has been covering geisha for the past 20 years, finds the culture fascinating. It is estimated that between 40,000 and 80,000 geisha operated nationwide in the early Showa Era (1926-89). Through her research, Asahara estimates that about 600 geisha are currently active in some 40 districts nationwide. Thirty years ago, geisha numbers in Niigata Prefecture were dwindling. Renowned for its abundant rice paddies and thriving trade, Niigata served as a distribution hub on the coast of the Sea of Japan. With so many merchants coming to Niigata, traditional Japanese restaurants and their geisha flourished from the Meiji Era (1868-1912) to the early Showa Era. At its peak, researchers believe there were about 400 geisha in the Furumachi district of Niigata, but that number had dropped to about 40 by the mid-1980s. But according to Susumu Nakano, a Niigata native and director and executive adviser of Bandai Silver Hotel, no apprentices in Niigata had started training for about 20 years, putting the youngest geisha in their late 30s. Like many other geisha districts, traditional Japanese restaurants had begun to close and fewer patrons supported the women. In a bid to halt the slide, Nakano founded Ryuto Shinko, a groundbreaking corporation that hires women and trains them to become furisode and tomesode, terms unique to the company that mean “apprentice” and “geisha,” respectively. The all-female musical theater group Takarazuka Revue was established in 1913 in Hyogo Prefecture by Hankyu Railway Co. founder Ichizo Kobayashi. The group is actually part of the rail company and, as a result, each member of the troupe is also an employee. A former tomesode of Ryuto Shinko (center) and two furisode make waves with towels in Niigata Prefecture. | COURTESY OF DAIICHI PRINTING CO.
Ryuto Shinko was established in 1987 with the financial backing of about 80 local companies. The company offers social security benefits, provides allowances for dancing and music lessons, and covers the cost of the entertainers’ kimono and wigs. The company also dispatches the women to events. Nakano says that it was hard to attract women at first because the job wasn’t something that was on the radar of many high school graduates. Ryuto Shinko was forced to offer a salary that was nearly twice that of regular first-year company employees, as well as provide accommodation. Thirty years on, Ryuto Shinko typically attracts between one and three new recruits each year, Nakano says. More recently, college graduates have joined the company and some continue to work after marriage and having children. 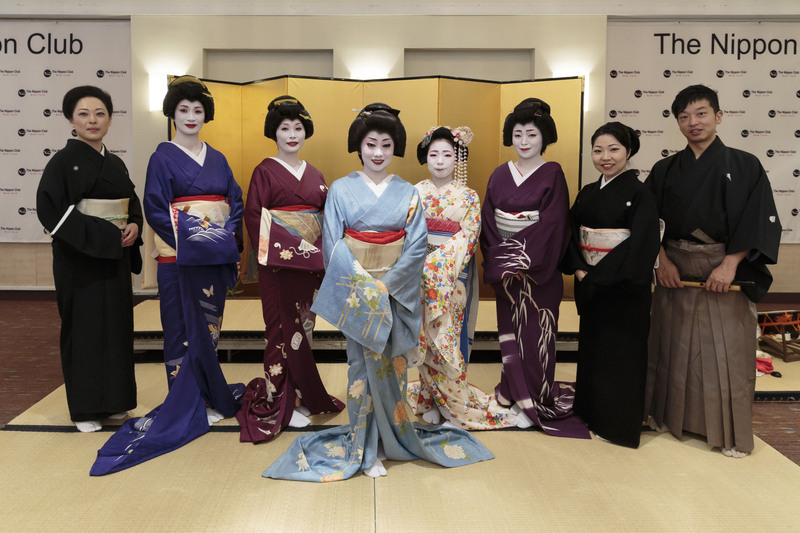 In the west Tokyo city of Hachioji, meanwhile, another group of businesses came together to support the local geisha community — in particular, an entertainer named Megumi. Megumi was born into a family that had no ties to geisha culture. However, she was asked if she was interested in becoming a geisha after meeting her future mentor at a Japanese restaurant where Megumi worked as a waitress. She was 22 years old. In the years between the Meiji and early Showa eras, Hachioji thrived on its textile industry. And as the city flourished, so too did its Nakacho geisha district, with more than 200 female entertainers operating in the neighborhood at its peak. After World War II, however, women increasingly stopped wearing kimono and began dressing in Western-style clothing. Hachioji’s geisha population faced certain extinction, with only 10 entertainers working in the industry in 1999, writes Asahara in “Geishashu ni Hanataba O: Hachioji Karyukai, Fukkatsu” (“Flowers for Geisha: The Revitalization of Hachioji’s Geisha District”), which was published by Fuuseisha Corp. in June this year. “The relationship between garment shops and geisha was so intimate that the district’s prosperity was directly affected,” Asahara writes in her book, which details the manner in which Hachioji’s geisha district has made a comeback. The book documents Asahara’s decade-long reporting in the district. Megumi continued to be the youngest geisha in Hachioji’s Nakacho district despite being well into her 30s at the time. In 1999, she decided that she needed to find some new recruits and created an advertisement seeking candidates. By coincidence, Hachioji Kurobei ni Shitashimu Kai, which was named after the Kurobei (Black Wall) street district where geisha once flourished, was also founded by local businesses in 1999 for the purpose of preserving geisha culture, says Shingo Fukuyama, current chairman of the group. Like the corporation in Niigata, businesses in Hachioji were also concerned with the decline of geisha culture in the city and decided to do something about it. Fukuyama, owner of local liquor shop Tsuruya, says there are currently about 150 active members of the supporters’ group, including some women. Megumi opened her own okiya boarding house for geisha in 2001, the first such establishment to open in Hachioji in 20 years. Three geisha at the lodging have since gone on to open their own boarding houses and in the 18 years since Megumi first put up the advertisement, Hachioji has seen its geisha population almost double. And last year, for the first time in more than half a century, a hangyoku apprentice called Kurumi made her debut. In 2014, Megumi started Hachioji Odori, a dance performance featuring geisha, which played on stage to a full house at Hachioji Icho Hall. The second performance was held in May this year. Her activities have even helped take geisha in Hachioji overseas to such locations as Australia’s Cowra, Hawaii and Shanghai. They’ve also performed in the lobby of a hospital, as well as at elementary schools. Megumi even appeared in the German film “Fukushima, Mon Amour,” a fictional story inspired by her actions following the 2011 earthquake and tsunami in Tohoku. After the disaster, Megumi had taken a shamisen to a geisha in northeastern Japan who had lost everything. Back in Nara, Kikuno is also trying new strategies. Using the internet, Kikuno has begun to reach out to geisha from other parts of Japan that are also struggling to attract a new generation. Traditionally, geisha don’t collaborate with groups outside their geographical areas, but Kikuno understands that it’s time for her to take a different approach. Kikuno also has a more personal reason for launching the Ganrinin project: She wishes to avoid dying alone. She has watched several geisha who don’t have an apprentice grow old without anyone to look after them. She pauses at length, eyes welling with tears, when recalling the plight of her shamisen teacher of 15 years, who passed away surrounded by just a few of her students. 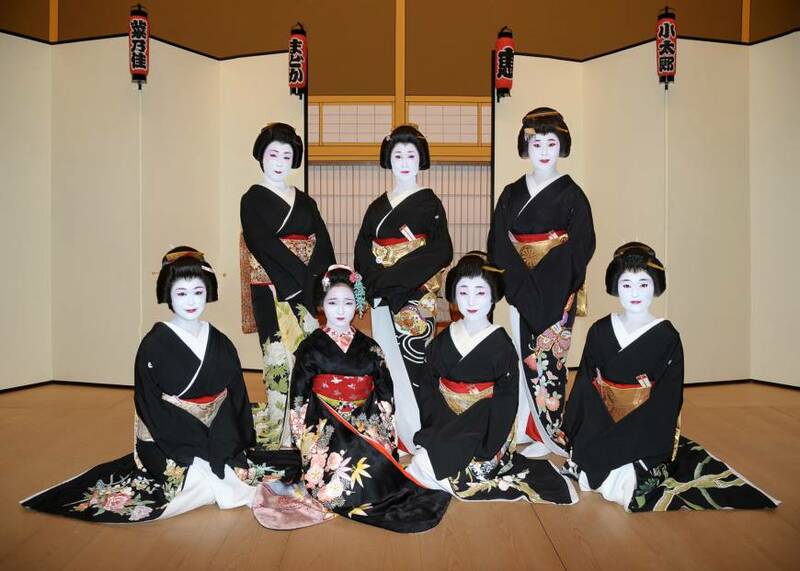 In February 2016, she hosted the inaugural Naramachi Hanaakari event and invited geisha from eight districts to perform their local dances. The event also included a symposium that featured experts discussing the rich history of geisha culture. 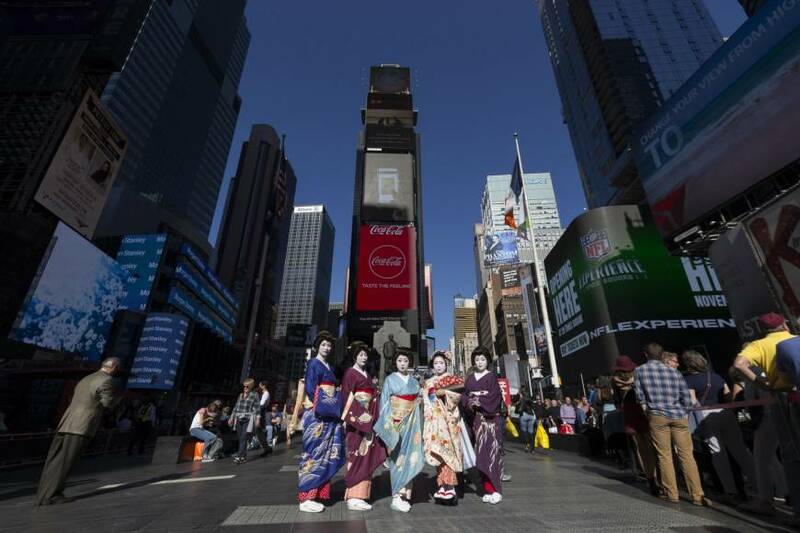 Just last month in October, she was joined by one of her maiko and three other geisha from Kochi and Ehime prefectures on a trip to New York to perform at the first Hanaakari project abroad. Kikuno stresses the importance of preserving the good parts of the geisha culture but also the need to evolve, enter new territory and try various things. 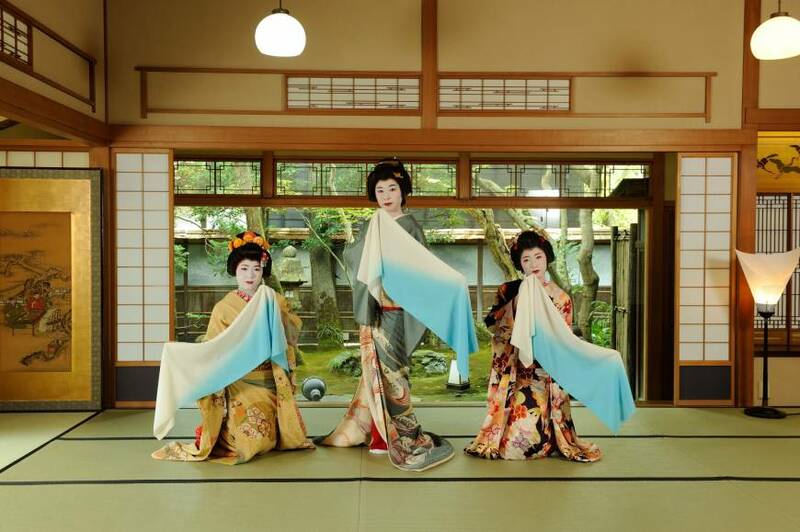 Because of her determination and creativity, three maiko and one trainee are now working in Nara. 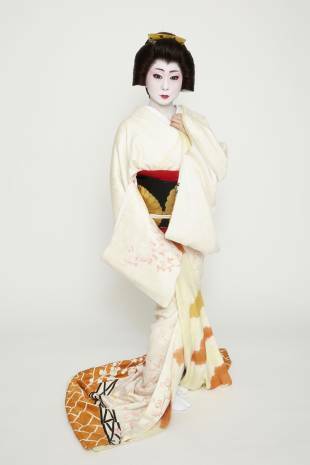 What’s more, one of her maiko, an apprentice named Kikukame, is set to become a geisha in January. Kikuno will finally have another geisha with whom she can work together side by side. 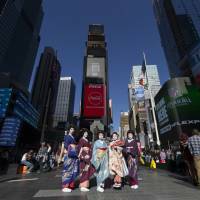 Geisha are female entertainers trained in traditional Japanese performance arts, including dance and shamisen. They are sometimes also called geigi or geiko. Maiko are geisha apprentices, although the term is mainly used in Kyoto and surrounding areas. In Tokyo, they are called hangyoku. Call them by their stage names such as “Megumi-san” or “onee-san” (“older ma’am”). 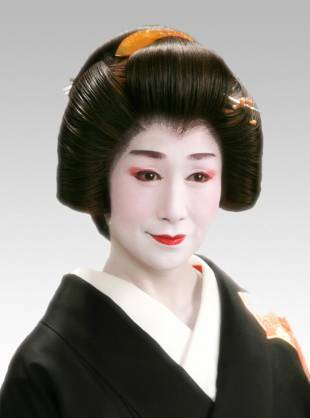 Even if the geisha is 100 years old, never refer to her as “obasan” (“middle-aged lady” or “obāsan” (“old lady”). Always wear socks or stockings. Never stand on a tatami mat with bare feet. Dress code should be business casual or more formal. Don’t forget to offer some sake to the geisha.